This article was first published in 2008. When the NSU RO 80 was released in 1967, the car was greeted with universal acclaim. It immediately won Car of the Year awards, and road tests in Europe, the US and Australia were glowing in their praise. Here was a car with not only a brand new design of rotary engine, but also a stylish and elegant body that had an aerodynamic drag figure superior to nearly everything. Add to that front-wheel drive, four wheel disc brakes, class-leading power steering and a well-developed suspension. And all from a company, NSU, previously known only for motorcycles and small rear-engine cars! The Ro 80 was a tour de force – but it sent NSU broke. So how did one of the most advanced and welcomed cars ever made prove such a disaster? It’s a fascinating technical story. Let’s start with the engine. 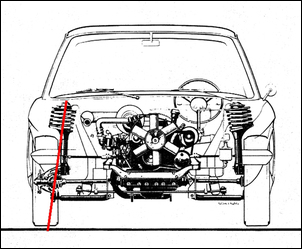 Mounted longitudinally at the very front of the car, the twin rotor Wankel used peripheral intake and exhaust ports and displaced 1 litre (497.5cc x 2). 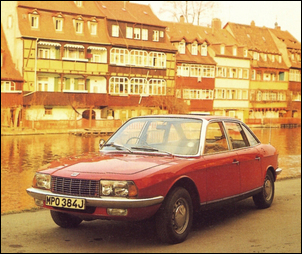 While one of the very first production cars in the world to use a rotary engine, the Wankel was certainly not an unknown design to NSU: at the time of release of the Ro 80, the company had built 3000 small rotary outboards and 2500 single rotor NSU Spider cars. The Ro 80 engine used aluminium alloy rotor housings and a 9:1 compression ratio. The rotor tip seals were cast iron and the wearing surface of the rotor housings was a nickel and silicon carbide coating that was electrically deposited. Two spark plugs per chamber were fitted (in later engines this was reduced to one plug per chamber) and the two plugs were fired simultaneously. Ignition on early engines was by traditional coil; this was upgraded to electronic ignition on later cars. Carburetion was by a twin-choke Solex, the unusual aspect being the use of one very small choke (18mm) and very large choke (32mm). These chokes fed long intake runners that merged only at the inlet ports. The exhausts of each rotor were kept completely separate. Power was listed at 113hp at 5500 rpm and peak torque 117 ft-lb at a high 4500 rpm. The peripheral porting helped give a strong top-end but low-rpm torque was poor – this graph is an interesting comparison of the Ro 80’s power and torque outputs compared with the contemporary Rover 2000TC, itself not a scintillating engine. As can be seen, the 2 litre Rover has about a third more torque at lower revs. 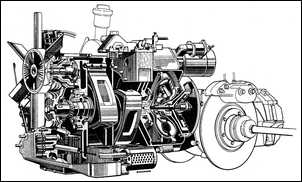 The Wankel was said to weigh only two-thirds that of a reciprocating engine developing the same peak power, and furthermore, NSU said the cost of producing the engine would be reduced to well below that of a conventional engine – the target was 60 per cent of the cost of a six cylinder of equivalent power. At the time of first release, NSU engineers were said to have overcome the development problems of the rotary: chatter marks on the epitrochoidal surface, apex seal wear and high oil consumption. The car’s warranty was two years or 24,000 miles – far better than the then prevailing average. Bolted to the back of the rotary was an interesting transmission. Similar to the Sportmatic design used in some Porsches of the time, the Fichtel and Sachs semi-automatic used a vacuum servo-controlled clutch, a torque converter and a 3-speed all-synchro transmission. Incorporated in the gear lever knob was a micro-switch that triggered the clutch. In normal town use the gearbox could be left in second gear, being driven as a full automatic. However, for better performance, the gearbox was changed conventionally. 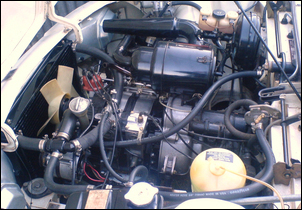 This semi-auto trans was the only transmission available; it was fitted after NSU engineers experienced snatching in the driveline on throttle lifts. (Remember that peripheral porting of the rotary!) The presence of the torque converter overcame this problem. Some drivers loved the transmission, while others hated it. It appears that the system had to be finely adjusted if jerkiness – especially on down-changes – and noise were to be avoided. In any case, off-the-line acceleration was always leisurely. Drive was to the front wheels - the whole engine and transmission being mounted ahead of the axle line. Just the refined and sophisticated driveline would have made the Ro 80 a startlingly innovative car, but there was far more. 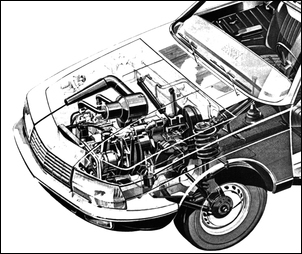 The front suspension was not groundbreaking in the mould of the contemporary Citroen hydro-pneumatic systems, and the hydraulic Hydrolastic system fitted to some Austin models, but it was still extraordinarily well developed. Rear suspension took more than a passing glance at BMW and Mercedes Benz practice and used semi-trailing arms (angled at only 10 degrees) and mounted on a sub-frame. Like the front suspension, spring and dampers were concentric. No rear anti-roll bar was fitted, something that certainly raises modern eyebrows. Rear wheel travel was an astonishing 10 inches. Road testers and owners alike commented on the extraordinarily comfortable ride, one that had little pitch. Initial tests were also glowing in their praise of the car’s handling, it being said to have only a touch of understeer. However, later tests – perhaps within the context of improving front-wheel drives – talked about a lot of body roll and understeer that could not be throttle-controlled. The tail, for example, stayed resolutely planted, no matter what was done with the accelerator pedal or steering! Tyres were to modern eyes tiny – just 175 width on 14 inch rims (alloy on later cars). The specified tyres were, however, very high performance – Michelin XAS radials. 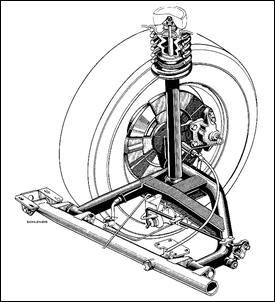 The ZF steering used a geared rack and pinion system, aided as standard by a hydraulic ram. 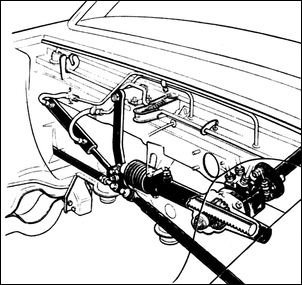 Steering feel was said to be excellent at all speeds, however, as time passed and power steering became more common, the 3.75 turns lock to lock attracted some criticism. Very unusually for the time, the steering column did not extend past the front bulkhead, improving safety in the event of a front-end crash. In contrast, most cars then had steering columns that extended well forward; the steering wheel being pushed into the driver as the front crumpled. One of the most interesting aspects of the steering is one that is not actually identified in accounts of the car – the amount of scrub radius provided by the front steering geometry. By all accounts, the Ro 80 was wonderfully stable in poor conditions, something often associated in the contemporary road tests with the front-wheel drive chassis. 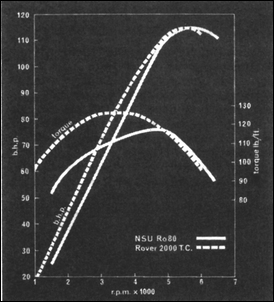 However, looking at the drawings of the Ro 80, it appears that very little scrub radius was used – and in fact, depending on where the exact pivot axis is drawn, it could even be negative rather than the then-universal positive. At minimum, it certainly had very little positive scrub radius. Even in the braking system the Ro 80 was unusual for the time. Front discs were large and mounted inboard either side of the gearbox. Rear brakes were also disc and incorporated separate drums for the handbrake. The braking system used a tandem master cylinder with two independent circuits – one circuit operating all four wheels and the other, just the front wheels through the second pair of cylinders on the twin pot brakes. The rear brakes used a load-sensitive proportioning valve. 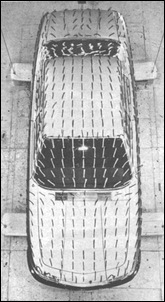 The low drag co-efficient (and relatively small frontal area – the car was quite low) were responsible for the ability of the Ro 80 to run to 117 mph on only 113hp (that’s 188 km/h on only 84kW!). The car had a mass of about 1300kg. 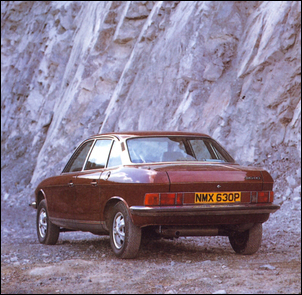 The Ro 80 had a range of competitors; in most European markets it was compared with cars like the Rover 3.5, Jaguar XJ6 and Mercedes 280SE. Interestingly, in acceleration to 100 km/h, maximum speed, fuel economy and the standing quarter mile, it was largely inferior to these cars. In fact, only in fuel economy did it comprehensively beat the thirsty XJ6. 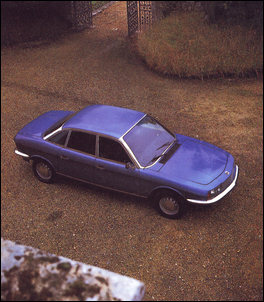 Another car that the Ro 80 was compared to was the Citroen ID20. Against the Citroen it had similar performance but had much poorer fuel economy. However, the NSU handled better. A 1968 road test best summaries the strengths and weaknesses: Wankel engine smooth and quiet; performance good, economy poor; very quiet at speed and handling outstanding; well made, roomy and very comfortable. Initially the demand for the Ro 80 was so high that there was a waiting list. Owners raved about the cars, particularly their ability to travel long distance in silent stability. Fuel economy, especially away from city confines, was within the ballpark of other cars of the same performance and if that performance was a bit sluggish off the line, well the mooted triple rotor Ro 80 would soon fix that. And then, all at once, the whole thing came crashing down. When engines failed NSU replaced them at a nominal charge (and often free), but the costs of doing so sent the company into a downwards spiral that was arrested only when it was taken over by Audi/Volkswagen. Designed from the ground-up for the new-age rotary engine, the Ro 80 incorporated the very best clean-sheet design aspects that could be then integrated into a safe and stylish car. Compared with its German prestige competitors, it was daring; perhaps only the French Citroen went even further. 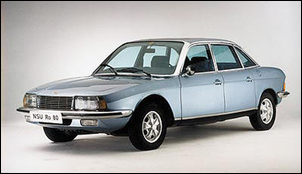 Perhaps not inconsequentially, Citroen was also working on a rotary powered car – it also proved a failure. However, the NSU engineers’ work was not in vain: many innovations of the Ro 80 were to become mainstream over the next two decades – but the rotary engine was not one of them. The world's brightest flashing bike tail-lights? The key to understanding lots of car-related things! Want better economy or performance? Leave the factory filter in its place!